In our culture, we are inundated with promises of ways to improve our appearance and look younger. We buy and try hoping this latest anti-wrinkle product, injection or process will work. But what if there were a treatment that made you look better in a little over a month with no recovery time or risk? And what if it made you feel better as well? Mei Zen Cosmetic Acupuncture System is a multi-session process of exact needling protocol designed to bring chi, or life-force energy, to the face and improve or increase collagen production. Out of her Hopewell Junction office, Dr. Laurie Mallis brings this ancient Chinese practice to the Hudson Valley. In addition to facial acupuncture, which I experienced, she also offers the Mei Zen Acupuncture System for weight loss, abdominal toning and fertility. 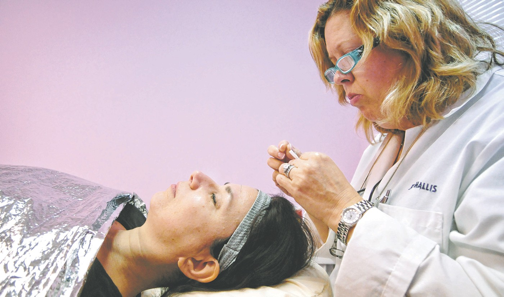 Our journey began with medical acupuncture treatments (see May issue). At the time, I was physically and energetically depleted and needed to be in better condition to proceed with Mei Zen. Mallis says those in a weakened state, those who smoke or drink heavily, and those who simply don’t take care of themselves, are not good candidates. That’s why she includes a complimentary consultation for potential clients to uncover anything that might counteract a successful outcome. So what is a successful outcome? Reported benefits include improvement in the fine lines of the face and a diminishing effect on deeper wrinkles, improved skin tone and texture, improved muscle tone and firmer jaw line, reduction or elimination of rosacea and acne, fading of age spots and overall health improvement. A 2010 blurb in O, The Oprah Magazine, reported glowing skin after just one session. Before I started the treatments I had begun to avoid looking at myself in the mirror. I didn’t like the face I saw. In fact, I didn’t really identify with it as my face. It looked too haggard, the years dealing with my mother’s illness etched there. Because Mallis spent 25 years as a medical doctor before trading her prescription pad for acupuncture needles, she understands both Western and Eastern health philosophies and believes firmly in the bridge between the two. It’s for that reason that she choose to study Mei Zen. “It is the only cosmetic procedure that also improves health,” she said. Since her goal for forming SearchLight Medical in 2010 was to help her patients achieve optimal health, she liked the Mei Zen approach of including body points with facial points for a positive effect on the body, mind and spirit. The system has a strict protocol of 10 treatments scheduled twice a week for five weeks. Each session lasts about an hour and a half. This is not a time for vanity. No makeup or moisturizer. Harsh fluorescent lights. Mallis’s little camera will capture me forever in this moment in time. Luckily, she doesn’t share the shots, and I don’t ask to see them. I lie on the table, simultaneously eager and leery. Mallis takes my pulse on both wrists — according to Chinese medicine, there are three pulses on each side that correspond to internal organs — and then begins needling body points: My ankles, my hands and the crown of my head. In some places on my body, particularly the sides of my hands, they prick going in, feeling, well, like needles. The needles she uses on my face are smaller than the body point needles, and they aren’t inserted very deeply. Despite their lack of depth, when she inserts needles around my eyebrows, hitting what she terms my sinus points, I nearly jump out of my skin. I can feel the energy shoot down into my sinuses as if she had just inserted two pipe cleaners. On the other hand, I don’t even notice the needling around my jaw, neck and ears. All in all it takes her about a half hour to insert 88 needles on my face. I can’t even imagine what I look like. After the needling, I am left to rest for about a half hour and then it takes her about a half hour to remove all the needles. Despite what the reporter for O magazine hyped, after one session my face is not glowing, but neither is it bruised, blotched or pocked. To me, it looks exactly the same. Session 2: After Mallis finishes needling, I lie in the dark feeling like Frankenstein’s monster when the doctor generates electricity and brings life to the monster. I feel currents pulsing through my body. I feel alive. Session 3: I arrive with an annoying canker sore and by the session’s end don’t feel it. It’s gone the next day. Session 4: I employ yogic breathing and relaxation techniques instead of tensing when Mallis inserts the needles. She also applies arnica cream to my sensitive points. Both help. Session 5: During the rest period, I imagine my face lifting and smoothing and see it transforming in my mind’s eye. The energy that has been pulsing through my body during prior sessions reaches my face. Session 6: A Poughkeepsie Journal photographer and a videographer immortalize the session. My hypersensitive spot on my right hand is itchy after Mallis removes the needle, and when I examine it there’s a white bump, exactly like a hive. Mallis says the needles are hypoallergenic. She needles herself in the same point to demonstrate that it shouldn’t hurt and says she has never had anyone as sensitive as me. We philosophize about why — physical or emotional — that particular area is such a sore spot for me. Session 8: Again I feel electricity around my face and body. For the first time after a session my face looks blotchy. Session 9: During the resting peri- od, the energy is pulsing from the top of my left shoulder to my finger tips so much that it feels as if my arm has blown up to twice its size. After the hive experience, I wonder if I’m hav- ing an allergic reaction and yell for Mallis. She assures me everything looks normal. After she removes the needles the sensation subsides but my arms feel as if I’ve been lifting weights. Session 10: My husband has been sick with a bad cold all week. I tell Mallis I’m not worried about catching it, I feel invincible. I have not gotten sick since my medical acupuncture sessions months ago. And with all this energy pulsing through me twice a week for over a month, how could I not feel great? This time during the session, the energy breaks through my left arm, pulses across my upper chest and down into my right arm. I feel connected by energy currents head to toe, hand to hand. Photo session: Like watching your children grow, you just don’t see it. SoI am anxious for the photo session. The photo conditions are identical to a month ago: No moisturizer or make-up, the harsh lights and the pocket camera. First glance at the photos I’m disappointed. They don’t look as good as I felt. Then Mallis pulls out the pre- session photos. Side by side the difference is remarkable. The tired, haggard, dull face has indeed transformed. The face in this new photo looks rejuvenated, alive. This is the face I remember, this is my face and I like it again. Mallis told me that some of her patients sleep through the treatment. I was not one of them. I was ultra sensitive to most of the needling, but the discomfort only lasted momentarily. I loved the currents of energy coursing through my body. Focusing on that and visualizing a transformed face made the insertion process easier. The results are supposed to last two to five years, though there is maintenance involved with a minimum of treatments every six months (two in one week) and a maximum of once a month depending on your preference and the amount of care you give your skin (Mallis emphasizes using SPF 30 sunscreen daily). The most important thing is to manage your expectations. Every line and wrinkle will not be removed. But Mei Zen is a completely natural and holistic way to improve your appearance and your health. The Holistic Guinea Pig is a monthly experiential look at holistic practices in the Hudson Valley. If you have a holistic practice or therapy you would like Linda Freeman to experi- ence and report on, contact her at holisticguineapig@gmail.com. By Linda Freeman. Originally published by The Poughkeepsie Journal in its Living & Being Guide to Wellness, Alternative Medicine section, in July 2012. Start on YOUR path to wellness today!